I got it! I got it! I got your number on the wall! I got it! I got it! For a good time, for a good time call! 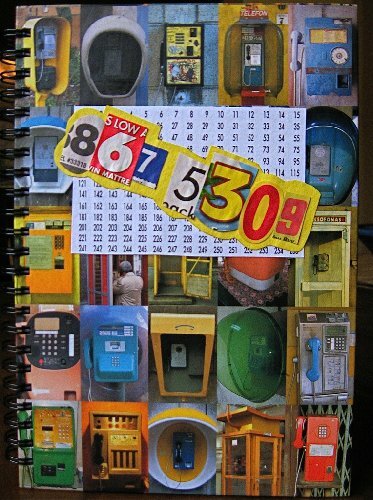 This telephone/address book is now a Journal for The BookMooch Journal Project. How this works: Add your Artwork involving numbers. If other mathematical concepts are more to your liking (pattern, tesselations, geometry, tangrams, fractals, polyhedra, symmetry, iteration, tangrams, trigonometry, spatial reasoning, quantitative estimation, etc. ), who’s gonna stop you? You are encouraged to sign your contribution, with your BookMooch username and/or your real name if you wish, along with the date you completed your artwork. Feel free to pass the book around to your local friends, who aren’’t on BookMooch, as long as you’’re willing to make sure this journal will get back into the system. NOTE: Contributions to this journal will be photographed and posted on the Web (at Flickr and at the main BookMooch Journal Project web site.) You’re welcome to photgraph and post a picture of your own contribution to Flickr, but that’s not required. Recommended time to keep a journal before passing it on is two weeks. After you and your fellow creatives are done adding your art, please put the journal back into this same page I’’ve created for it here at BookMooch so someone else can mooch it and add to it. When this book is full, please contact [Tim] who may be reached through his account at BookMooch [http://www.bookmooch.com/m/bio/ereneta], to send the journal home. I can’t trace this journal, but it does not appear to be travelling.